While I was still trying to figure out an unexpected 326 mg/dL postmeal reading following the same premeal reading, the same meal and same insulin dosage, much of the blogosphere was discussing the recent news from Brazil. "We all realize that without addressing the problem at the level of the immune system, we'll never really beat Type 1 diabetes," said Dr. Francisco Prieto, who treats diabetics in his Elk Grove, California, practice. However, my attention was instead called to a recent development in Australia that was announced on my birthday (April 1). 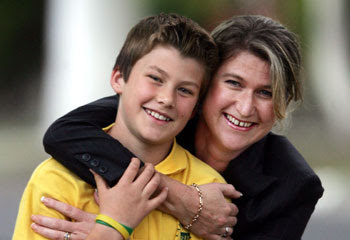 World first: Connor Ahles and mother Janine. According to the press, he is the first child in the world to be immunized against type 1 diabetes. Picture by Rob Leeson. A boy named Connor Ahles was reportedly the first child ever to be vaccinated for type 1 diabetes. Connor was found to be at high-risk for type 1 using the methods previously used in the unsuccessful Type 1 Diabetes Prevention Trial 1 (DPT-1), which successfully identified "at risk" patients, although was unsuccessful in preventing the disease. However, the researchers believe that the dosage of insulin may have been too small to make a difference. Regardless, Connor Ahles will take an insulin vaccine through a nasal spray once a week for a year. The vaccine was developed by a team that included Associate Prof Peter Coleman from Royal Melbourne Hospital and Prof Len Harrison from the Walter and Eliza Hall Institute of Medical Research. Apparently, early tests have confirmed that the vaccination can encourage immunity against type 1 diabetes by activating protective immune cells which seem to be in short supply in people with some 80+ autoimmune conditions, including type 1 diabetes. Connor will be joined in the test by 300 children and young adults in the next two years. Hospitals across Australia and New Zealand will be involved. While I think both developments are promising, I will reserve my excitement for the large-scale clinical trial results on both! Happy birthday. I trail you by a week. Wow, there's just a lot happening right now in diabetes research. I think we may yet see some significant development in our lifetime. We're blessed to live in exciting times. The Brazilian study in practice is very very expensive for the procedure with conditions that the onset of T1DM be no more than 6 weeks. That would exclude me and the majority of us w/T1DM. As you already know Scott, sometimes it takes 6 weeks or more to finally be diagnosed and treated for T1DM. Since I am Pragmatic when it comes to T1DM, I find that this study and the other you mentioned has no use to me at all than a confirmation of something which I have already known about since I was six. What would be more beneficial and meaningful to those of us w/T1DM is to have something available such as C-Peptide. Interesting news, although my excitement is tempered somewhat. I agree that c-peptide, amylin and a host of other elements play a critical role in healthy metabolism, and without these things, "control" is akin to starting a fire with a few sticks. Can it be done? Maybe -- if the sticks are dry enough, but its not quick, efficient or 100% guaranteed. Having said that, I would just note that with each discovery another piece to the puzzle is put into place -- the only challenge is that its a 150,000 piece puzzle and the medical profession doesn't have a picture to guide them! WE are not in the correct "Time-Line" as far as cures/discoveries are concerned other than being on the receiving end of a new Gadget such as an Insulin Pen that looks like a Fountain-Pen or a new type of Insulin Pump. I am not complaining regarding all of the ways to make T1DM easier to Manage however, the priorities of preventing and/or repairing Damages/Complications that are a real part of having T1DM has yet to arrive, other than the ACE Inhibitors and Statins. C-Peptide has been Researched and shown to be effective/beneficial for T1DM as well as having a synergistic relationship w/Insulin. Why is this not available to us? Happy belated birthday. I'm on 4/11. Neat to see that you and Bernard are April guys too! I believe I was also diagnosed in April as well, so I acknowledge that on/near my birthday too.